Though I was only able to spend a couple of hours this morning at the summit arranged by PNWER, it was a great turnout of both government emergency managers at the city, county, state and federal level; as well as the business continuity experts from companies like Microsoft, T-Mobile, Puget Sound Energy, PACCAR, Safeway, Liberty Mutual, BECU, Costco, Starbucks, Pinkerton and other regional players. We know that the probability of a Cascadia mega-quake like Chile's 8.8M or Japan's 9.1M event is relatively low in this area over the next 50 years -- lower than I thought -- but we also know that we live on the Cascadia fault line, and that an earthquake is probably the worst case natural disaster we can imagine for the area. The percentages of probability are higher on a deep magnitude 6.5 earthquake -- about 84%. Earthquake scenario planning events are widespread this year as planning efforts mature nationally on the government side of emergency management. The keynote address was delivered by Bill Steele, from the Pacific Northwest Seismic Network at the University of Washington. He was able to make the impacts of different magnitudes of earthquakes clear to everyone in the room. So many of the monitoring and alert tools now being developed rely upon the Internet, so there was a question of whether or not the Internet would be available in a catastrophic event. So far, at least in Chile and Japan, the monitoring devices and alert systems stayed live. Here's a picture of the fault zones in our area. Bill described Seattle and Bellevue as being part of the "Puget Sound Squeeze Box," and the picture illustrates why. 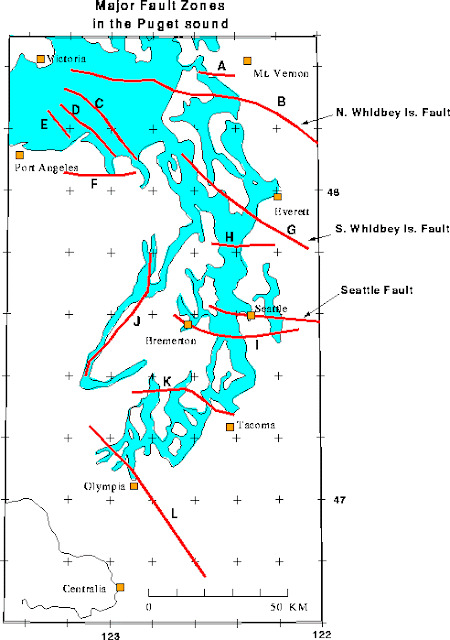 The Seattle Basin area in particular will be subjected to higher amplitude and longer duration of shaking. The purpose of today's summit is to improve overall resilience of the region. Where earthquakes are concerned, the goal today is to start defining what improvements in economic and business recovery would look like for the private sector. This is truly where government can't do it for us, it's the private sector that must step up. It's not just Seattle that's been hit hard by weather so far this year. We've got snowstorms and tornadoes in other parts of the country. 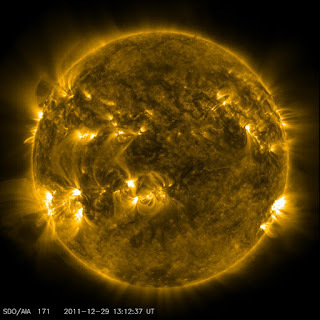 And now, here comes a large geomagnetic storm! You can read more about it in the Facebook post from the National Oceanic & Atmospheric Agency. Meanwhile, here in the Northwest there are only a few thousand people still without power after snow, more snow, and an ice storm that was followed by high winds into Saturday morning. When we first moved into our home in the late 70s, this Douglas Fir looked like a replanted Christmas tree. Maybe it was. Over the years, it has become part of my visual landscape. It's just outside the windows on the front dormer, where my office is located. We lost one branch on Monday morning. Though it looks pretty small here, it is a large bough and made a loud sound when it dropped. I am hoping it is the only branch we lose in this snowstorm-now-ice-storm. Some power lines in the Puget Sound area are now coated with anywhere from one quarter to three quarters of an inch of ice. The trees have the same problem as the power lines -- the risk is that the weight of the snow and ice combined is so heavy as to cause the line/bough to come down. Estimates are of up to 140,000 homes at this time without power. So if you're reading this and have not pulled out all your devices to charge, please do so now. And set up Twitter contacts with your city and your neighborhood blog so you can receive updates on power related issues even if the power is off. Above all, if possible, stay inside and stay safe! Children and adults alike seemed thrilled by the snowfall that has blanketed our area and is now starting to taper off. Looking ahead, we can anticipate freezing rains unless the temperature rises more rapidly than projected, leaving roads still perilous for travel. Then once the temperature comes up, the next thing to worry about is flooding. I know I mentioned this in the book and here on the blog the other day, but keeping the storm drain near your home clear is really important once melting sets in. Once the snow goes down and you can see the drain, be sure it is free of leaves or other debris that might cause it to back up and allow flooding. 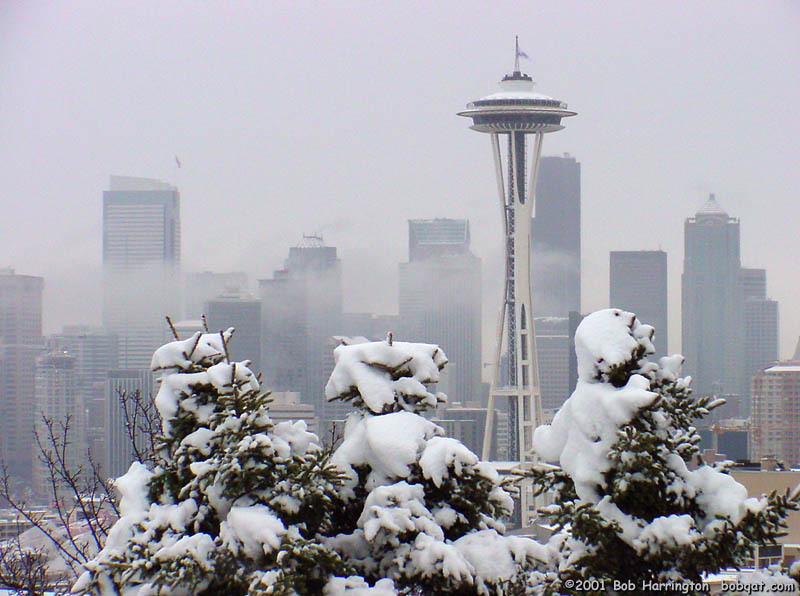 That being said, here's hoping that if you live in the Pacific Northwest you are enjoying the suspension of time that such snowfall brings. And if you're at work, please be especially careful driving home this evening. We've had intermittent snow since Sunday. It's Tuesday already, and many of us are stir crazy. But the worst is yet to come. We've had lots of advance notification and tips on how to prepare for a storm tomorrow that could land anywhere from five to twelve inches of snow on the region. It probably won't stick around long, but it has the capacity to do a lot of damage while it's here. As one of the leaders of both a neighborhood preparedness team and co-chair of the state's financial services coalition, I can tap into the latest breaking information on the snowstorm(s) from my own communications center. I can say unequivocally that the City of Seattle is doing a great job of keeping its citizens informed. 1) Have food on hand that can be eaten without a lot of preparation. If you've got an emergency supply kit, then check it to see if anything needs to be replaced at this time while you can still get to the store. 2) Test all your flashlights and leave them in the most highly trafficked areas. 3) Identify the layers of warm clothing and extra blankets, hats, gloves and coats you'll wear around the house and to sleep. 4) Make sure you keep all your electronic devices fully charged. 5) Check on any neighbors who may have special needs during such a time. 6) Be very careful what you use as a source of heat or power during an outage. As we've noted in several recent blogs, unattended candles are dangerous, as are open flames. And don't bring gas grills or portable stoves inside your home. The fumes can kill people. 7) Because the heavy snow tomorrow will be followed by warming weather and rain, be sure to keep an eye on your street drains and clear away the leaves so the drain does not clog and cause flooding. 8) Check with your employer to see if you can plan now to work from home tomorrow. If you do plan to go to work in the snow, then be sure that your car is equipped with an emergency supply kit and that you are carrying extra clothing and supplies for work in case you have to spend the night in your office. Finally, don't take unnecessary risks...and don't wait until the last minute to complete this checklist! We're a slow and quiet city today. Snow has made us that way. As I read the most recent update from the City of Seattle's Emergency Operations Center, I was struck again by how simple acts of carelessness cause fires, even in this enlightened city. The first full response fire in the middle of the night was because of candles left burning in the kitchen after the resident had gone to bed. Chilling, isn't it, to think that this could happen even in your own home if you aren't alert enough to double check that all fires are out before retiring? This happened to have taken place in a complex where 36 other residents were evacuated and shivered on a bus brought in to shelter them from snow and cold until the fire was completely out. The second full response fire is even harder to grasp, since the media has spent so much time telling us the story of the Connecticut fire that killed two adults and three children. In last night's events, fireplace embers were improperly disposed of, in this case to a garbage can near the house. So the fire climbed the outside wall of the house into the eaves. I'm a big fan of fire safety and especially fire fighters with their rapid responses, in part because of a fire from an electrical short that once consumed the third story of our house in Rochester, N.Y. It was an instructive and expensive lesson for us at the time. So in the words of Sergeant Phil Esterhaus on Hill Street Blues: " Hey, let's be careful out there, people!" In the fourth chapter of my book that discusses travel risk, I talk about how some travelers inadvertently make themselves a target by the way they dress, the jewelry they wear, and the way they walk. I want to add one item to that, and it applies whether you are traveling abroad or walking at home. Unless you are interested in being robbed, don't use your smartphone while walking on the street. Put it away until you have arrived at your destination, and stay alert. Smartphones take your attention away from what is going on around you, and they make you an obvious mark. If you're using its map function to know where to go, then take the time before you start walking to absorb what the map indicates. If you need to check it again, then stop in a safe place and do so without compromising your personal safety. I want to reach the broadest number of people I can with this book, so marketing it will be a continuous process. Someone said that this book would be a great present for newlyweds, but I think it also makes a great gift for new homeowners. Check out a two part discussion here on Northwest Real Estate Forum interviews. In Advice From A Risk Detective, we discuss the need for smoke and carbon dioxide detectors and recommend that, if you live in a multi-story home, you have a fire extinguisher on each floor as well as a rope ladder and an escape route. This New York Times article follows up on the terrible Christmas Day fire that killed three children and their grandparents. There has been speculation about the cause of the fire in a home that was undergoing renovation; but here the suggestion is that fireplace coals were removed while still warm so that [shiver] Santa could come safely down the chimney. There are plenty of lessons that could be learned from this story. If your home does not already have detectors installed, please consider doing so as soon as possible. I may have mentioned in an earlier blog that our neighborhood disaster preparedness team is working to get a maintenance company to come and service all the fire extinguishers in the neighborhood on a single date. This article has strengthened my determination to get this done in the first quarter of this year. Though I wrote about both social media platforms in Chapter III of my book, I must confess that posting on Google + is not something that comes naturally -- especially after I go through the three part morning ritual of "Anne's Take" on the ASA website, then a Tweet, then a Facebook post on the company page. If you're enthused about Google + and use it, please let me know. A recent story I read indicated that Google+ is still picking up millions every day. They obviously picked me up, but I don't use it now that it's set up. Is this the case for others? The newspapers yesterday and today are filled with stories about good intentions and new habits. Those stories are interspersed with news stories that illustrate just how very difficult it is when political positions harden to effect a compromise that will move the country forward at a time of economic peril, when growth is stalled. Against those two very different types of reporting, we read almost daily about data security breaches and natural disasters that cause global supply chain issues that affect American manufacturers. Businesses continue to lay off workers or sit on their capital to wait and see what's going to happen in Washington. What can you do to move forward with confidence in such a world? 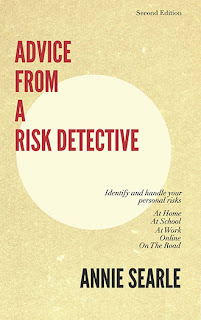 At the heart of Advice From A Risk Detective is the premise that if you are well prepared, you can manage your personal risk and safety at a different level than those who are unprepared. "Resilient" means "to bounce back," and that's just what the reasonable precautions described in the book are designed for. In today's personal blog I described an exercise I undertake each New Year's Day, that helps me establish a better handle on how I use my time and enhance the plans I already have in place. If you have your own version of such an exercise, I'd love to hear from you. Such exercises are always works in progress, but provide real momentum forward into the new year.